There is nothing more exciting than welcoming home a new baby! 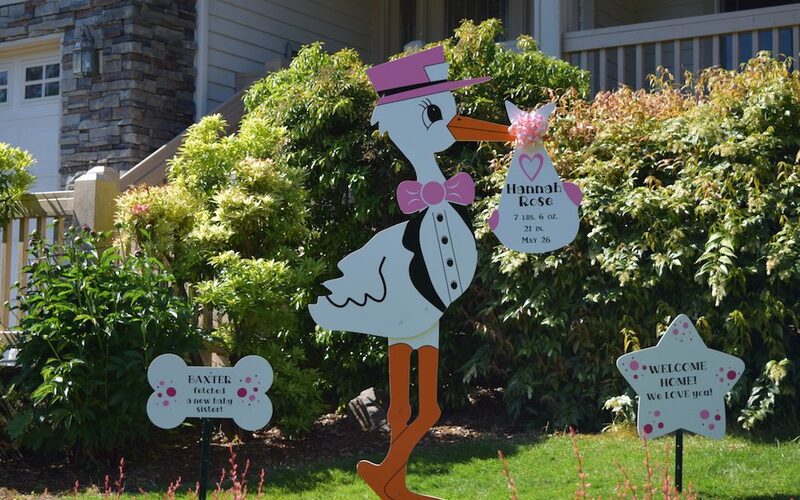 Rent one of our 6 foot stork signs decked out in pink or blue to announce the birth of your new baby. Let one of our adorable stork signs share the news about whether it’s a boy or it’s a girl! The stork lawn signs make wonderful baby gifts for new mothers, and can also be used for baby showers, gender reveals, or as a surprise pregnancy announcement for the expectant father or grandparents. Stork sign rentals are super fun for baby showers and can be used indoors or outside in the yard. They come with a customized baby bundle keepsake that includes the baby’s name, weight, length and date of birth that is yours to keep after the rental period is over. We can also provide you with cute customized signs for siblings that will make big brothers and sisters feel special too!